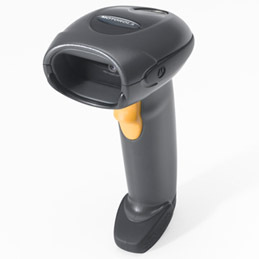 The DS4208 delivers the blazing speed typical of laser scanners on both 1D and 2D bar codes, allowing you to accommodate 2D bar codes without sacrificing scanning quality or performance. Users never need to take time to align the bar code with the scanner or pause between scans. And since you can capture bar codes printed on paper labels or displayed on the screen of a mobile phone, retailers can accommodate customers who download mobile coupons, mobile loyalty cards and more. You get industry-leading scanning speed on every bar code; true point-and-shoot first time scanning simplicity on even damaged and poorly printed bar codes; and a durable design for all day everyday reliability — all at an affordable price. Ambient light immunity Immune to normal indoor lighting up to 1600 Lux. Immune to sunlight up to 86,000 Lux. Drop specifications Withstands multiple 6 ft. (1.83 m) drops to concrete. Get the barcode system or barcode solution you need now for a small monthly payment and start reaping the benefits of barcodes! Need advice to work out what is best for your situation? Call a barcode expert now on (02) 9636-5299.